A former colleague at Texas Instruments responded to my “PowerPoint Woke Me Up” blog entry by saying that sometimes the most effective communication is that done on a whiteboard with other people. As I thought about that I realized that he was exactly right (at least it matched my experience). The vast majority of information is not written down. It is communicated verbally or nonverbally between individuals. We are conditioned as social animals to use this method most frequently. The advantage is that it is often quick. The disadvantage is the intended message can easily get lost somewhere between the speaker’s words and the listener’s interpretation. Meanwhile, many businesses are great fans of PowerPoint. Someone somewhere carefully (or sloppily) crafts a message that is presented. Much of the time there is one active presenter and multiple passive listeners. This can work but sadly it often doesn’t because the listeners are not engaged when they accept that the presenter is responsible for the communication. Why not draw pictures together? Pictures are powerful ways to represent information. Much better than phrases on a PowerPoint slide, pictures can show relationships, sequences and other interactions. And when they are created by multiple people together, they can embody the collective wisdom of the group. If this is done appropriately, the resulting picture includes both the understandings and agreements among the people. How powerful is that! The Grove Consultants International is a company that teaches graphical facilitation. The concepts are simple to grasp. Significantly, they all are aimed at graphically documenting what is most important. This works for topics like strategy, visions, value propositions, industry overviews and other similar things. The facilitation skills include the use of templates, creatively drawing to represent concepts and coordinating the discussions. Here is an example where a Grove template was used to create an industry overview. Pictures sometimes are a means to an end such as a specific decision. I have found that Sam Kaner’s book “Facilitator’s Guide to Participatory Decision-Making” is an excellent resource to help a leader understand how to reach a decision. 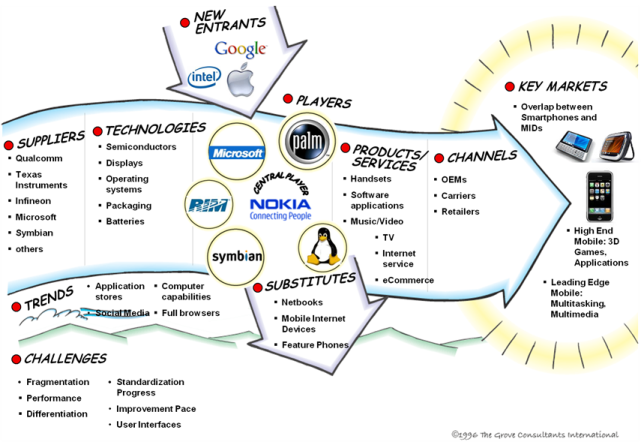 Kaner’s techniques work well with the graphical facilitation techniques used by Grove. Another excellent example of the powerful impact of drawing a picture together can come from a project retrospective. Norm Kerth’s book “Project Retrospectives: A Handbook for Team Reviews” is a valuable resource to describe how “looking back to move forward” is critical. His website at http://www.retrospectives.com/ explains the prime directive for retrospectives and more. One of the exercises in a retrospective is the project timeline. A long piece of butcher block paper is tacked to a wall. Then, all members of the team the document the project by adding their recollections to the timeline. The ups and downs, deliveries, significant meetings, personal events, etc., are all added to the group picture. When everyone is finished, the whole team examines the completed picture to answer four questions. 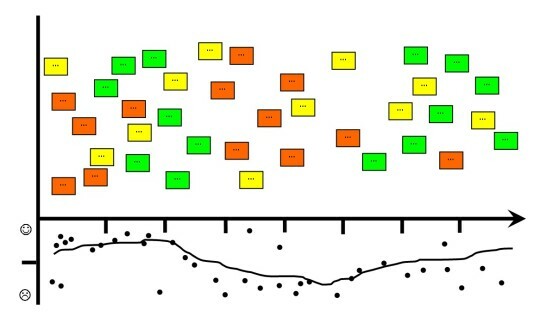 The actual format of the retrospective timeline is less important than the fact that the team creates it together. Here is an example from http://www.thekua.com/rant/category/retrospective-exercises/. Maybe the pictures we create together aren’t as pretty as the PowerPoint masterpieces. Maybe they cannot be fit into the company template. And maybe they don’t have transitions, animations, embedded videos and other special effects which would impress Hollywood producers. But what they do have is the powerful message created, owned and understood by a team. It seems that you have conflated the concept of a “report card” with the concept of information about a relationship. These are not the same! Report cards are an attempt to capture, tame, mechanize, and (too often) trivialize complex and subtle relationships. You don’t need to establish simplistic scales or polarized category schemes to get a sense of how a relationship is going, do you? Even if you find report cards helpful, the insidious side effect of that approach is to warp our view of relationships such that only what is overtly measured will be acted on. That in turn will cause you to manipulate or overload the measured parameters so that they also represent the unmeasured ones that you care about– which turns the whole thing into little more than a game of sanctioned lying and mythmaking. If you sanction even one kind of lie or one kind of oversimplification, all lies become okay. See, you have me doing it, now! That last statement was itself an oversimplification. I do not want to be measured by a report card, as if this were some sort of video game leader board. I want to my clients to reflect and converse and make sense of things fluidly.